I take a tour this morning, which takes us over the new highway to San Jose, but we turn off early and go to the upper reaches of the Taracoles River for a mangrove swamp boat trip. We see nesting Scarlett Macaws (from a distance), Crocodiles, a Jesus Christ Lizard, and some birds. The boat trip really doesn’t live up to my expectations, since it is so rushed, and we really don’t cover much of the river. The mangrove boat trips I took on previous visits to La Ensenada Lodge and Tamarindo were so much better! The bus then takes us to nearby Orotina for a train ride back down to the coast near where Rotterdam is docked. The train trip is interesting, especially when the middle passenger car derails! The train crew uses a diverter to manoeuvre the car’s wheels back on the rails in short order. 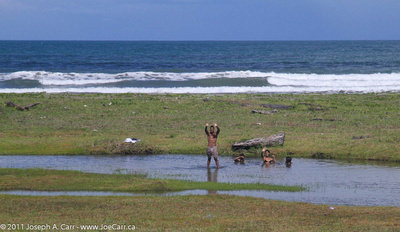 We see lots of interesting things along the way, including fields of cantaloupe and watermelon, the backyards of many Tico houses, some cute kids waving at us as we pass by, a long tunnel, and we cross over a river and see ever changing vegetation as we descend to the Pacific Coast. The bus is waiting for us at the station at Mata de Limon to take us back to the ship, which is only five minutes away.